Visit the ASU Art Museum in Tempe - It's Free! The ASU Art Museum is a contemporary art museum with five galleries in a spacious and modern facility located within the Nelson Fine Arts Center. While Arizona State University has a School of Art which is part of the Herberger Institute for Design and the Arts, the ASU Art Museum is not a showcase of student or faculty art. It features contemporary artists, both regional and international. Typically, exhibitions here often deal with current societal issues. While the ASU Art Museum's collections are rich in ceramics and prints, a variety of artistic media is showcased here. Southwestern and Latino art are well represented in the collection. ASU Art Museum Tip: The ASU Art Museum has one permanent collection gallery and five rotating exhibition spaces that change every three months. That means that even though some of the galleries may be showing art from the permanent collection, the additional galleries rotate exhibitions of national and international artists, so chances are it may be different than the last time you visited. The ASU Art Museum collection includes contemporary art, Art of the Americas (American and Latin American), more than 5,000 prints ranging from an early Bible page to contemporary work, 3,500 ceramic pieces, and American crafts. Exhibitions at ASU Art Museum strive to be more than just displays of random art, or artist collections. The museum presents art in a way that invites visitors to consider issues facing our society, cultural exploration, social initiatives and historical perspectives. Traditional and non-traditional media may be used in the artistic representations. ASU Art Museum Tip: The prints are housed and secured in the Jules Heller Print Study Room and may be viewed by students, scholars and general visitors by appointment. Sometimes prints are used in exhibitions to which they relate. The Ceramics Research Center moved to 699 S. Mill Avenue, Suite 108 in 2014. It used to be across the street from the main museum, with free parking. Admission is free, but if you drive you'll have to park at a meter or in a paid parking lot. It is about four blocks from the 3rd Street and Mill METRO Light Rail stop. While some people view ceramics as simply a craft, ASU Art Museum created this special Center to showcase and allow for the study of ceramics as art and those artists making significant contributions in the ceramics field. There are more than 3,500 objects. ASU Art Museum Tip: Throughout the year visitors may participate is gallery lectures, demonstrations with artists, and other educational programs. ASU Art Museum hosts several events each year to encourage members of the community to come out and enjoy the exhibitions. Some of the events are especially geared to the younger crowd, so that children can have fun and be exposed to artistic influences. The annual Short Film and Video Festival is a free event where you are invited to bring a lawn chair or blanket to watch the creations of filmmakers from around the world. Films change every year, and some might not be suitable for children. This is an outdoor, evening event. The annual Self-Guided Ceramics Studio Tour presents the work of professional ceramic artists in the Phoenix metropolitan area. Grab the map, get in the car and view working and living spaces of participating artists. Participating artists have a wide range of artwork on exhibit and for sale. The annual Street Party features live music, hands-on art activities and games for kids, as well as special exhibitions by local artists and crafts fair with hand-made items for sale is a fundraiser for Museum community outreach and educational programs. There is an admission charge for people 13 years and older. The first Saturday of each month (except July) is a great time to introduce the kids to the museum, during First Saturdays for Families. Create themed art projects to keep. It's free, too! On Family Fun Day in July the ASU Art Museum invites you to come in from the summer heat and enjoy an entire day of hands-on activities and and entertainment. ASU Art Museum Tip: The Street Party is not held at the ASU Art Museum. Check the ASU Art Museum Event Calendar for dates, locations, prices (many of the events are free) and details. 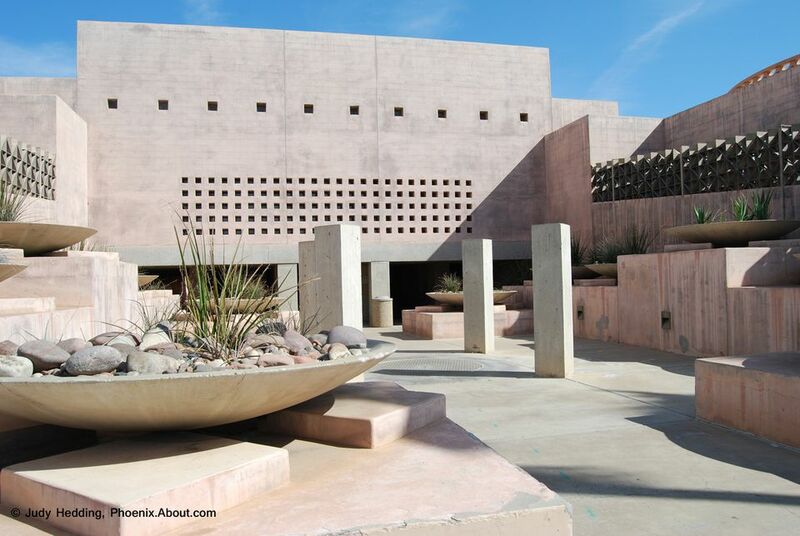 Admission to the ASU Art Museum, including the Ceramics Research Center, is free. There is a donation box in the lobby for those that choose to contribute. ASU Art Museum Hours: Tuesday from 11 a.m. to 8 p.m.(during school year) 11 a.m. to 5 p.m. (summer); Wednesday–Saturday: 11 a.m. to 5 p.m.; closed Sunday, Monday and holidays. ASU Art Museum is in the Nelson Fine Arts Center at Arizona State University at Mill Avenue and 10th Street in Tempe, Arizona. From the West: Take I-10 East to the AZ 202 Loop East. Take the Scottsdale Road Exit toward Arizona State University. Keep right at the fork to stay on Scottsdale Road. Drive south on Scottsdale Road. It becomes Rural Road in Tempe. Drive to University Dr. and turn right (west) to Mill Avenue. Turn left (south) to 10th Street. From Scottsdale: Take Loop 101 south to the 202 Red Mountain Freeway west. Exit Rural Road and turn left (south). Drive to University Dr. and turn right (west) to Mill Avenue. Turn left (south) to 10th Street. From the North: Take SR51 South to the 202 East. Exit Rural Road and turn right (south). Drive to University Dr. and turn right (west) to Mill Avenue. Turn left (south) to 10th Street. From the East Valley: Take I-60 east to Mill Avenue Exit 173, drive north to 10th Street. By Light Rail: Use the Mill Avenue and 3rd Street Station and walk south on Mill to 10th Street. Here is a map of the light rail stations. Parking at ASU Art Museum: Free parking is available at the Ceramics Research Center. The parking spots are marked as reserved for ASU Art Museum -- that means they are reserved for you! If parking in one of those spots, you must go into the Ceramics Research Center and sign a log so they know you are a museum visitor. You do not need to log out when you leave. If free parking area is full, there are some short-term parking meters in front of the museum and along Forest Avenue, so bring quarters. On weekends, there is more free parking than during the week. Here's a map of those lots. Need to know more? Visit ASU Art Museum online. All dates, times, prices, and offerings are subject to change without notice. At LEGOLAND Tempe -- Build. Play. Watch. Ride. So Much Fun to Have!